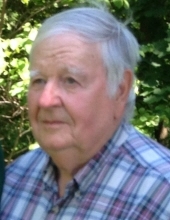 Charles A. Ollendick, 81, of Hills, died Friday, March 15, 2019 at the University of Iowa Hospital and Clinics. Mass of Christian Burial will be held Tuesday, March 19, 2019 at 10:00 am at St. Joseph Catholic Church, Hills. Visitation will be held Monday, March 18, 2019 from 4:00 - 7:00 p.m. at the church. Burial will be held after the Mass at St. Stanislaus Cemetery. In lieu of flowers, memorials may be made to Hills First Responders or St. Stanislaus Cemetery. Charles was born May 20, 1937 in Elgin, Nebraska to Bernard H. and Elizabeth (Baechler) Ollendick. He was united in marriage to Jean Trouten on April 30, 1960 in Cresco, Iowa. He grew up farming in Elgin, Nebraska and Cresco, IA and continued to farm after he was married in Richland Center, Wisconsin until 1965. His love of farming was cut short when his sons, Wayne, Joe and later Edward were born with hemophilia, a bleeding disorder, leading them to move to Hills to get specialized care at the University of Iowa. Although his love for farming was strong, his love for his family was much stronger. After moving to Hills in 1965 and working some short term jobs, Charles was a longtime employee at Advanced Drainage Systems (ADS) of Iowa City. He retired as the plant manager when his son, Joe, was having health issues. He was an active member of St. Joseph Catholic Church since 1965. He loved gardening, fishing, mushroom hunting, and was known for being an excellent wood worker, and loved to build. He was truly devoted to his family. He is survived by his children, David (Dede) Ollendick and Karen (Daniel) Karr, both of Hills; daughter-in-law, Samra Ollendick of Illinois; grandchildren, Jonathan, Joshua, Andrea, Dillon, Jeffrey, Brian, and Michael; siblings, Henry “Hank” Ollendick, Dorothy Salber, Francie Salber, and Bernadine (Dave) Sloan; sister-in-law, Kay Ollendick, and many nieces, nephews, and other relatives and friends. In addition to his parents, he was preceded in death by his wife, Jean, three sons, Wayne, Edward and Joseph; eight siblings, Marie (Lawrence) Hayes, Clara (Walter) Dorn, Theresa (August) Moser, Alfred (Ivy) “Fritz” Ollendick, Theodore (Hilda) “Ted” Ollendick, Louise (Tom) “Butch” Smith, Wilhelmina (Al) “Minnie” Kalvelage, Donald “Don” Ollendick. To send flowers or a remembrance gift to the family of Charles A Ollendick, please visit our Tribute Store. "Email Address" would like to share the life celebration of Charles A Ollendick. Click on the "link" to go to share a favorite memory or leave a condolence message for the family.